(Jan 22): Wall Street staged a modest rally on Thursday as oil prices recorded their biggest gain this year and ECB President Mario Draghi raised hopes of more stimulus for Europe. Seven of 10 major S&P 500 sectors climbed, with a 2.88-percent jump in energy stocks leading the way. Helping global and U.S. stocks, the European Central Bank kept its main rates on hold and Draghi said the central bank would "review and possibly reconsider" its monetary policy as soon as March. Many analysts had not expected a rate cut before June. Also boosting share prices, oil spiked from a 12-year low after U.S. crude stockpiles did not rise as much as feared. In the prior session, the relentless drop in oil prices and fears of a China-led global economic slowdown had sent the S&P 500 to its lowest since 2014. The index remains at lows not seen since September last year. 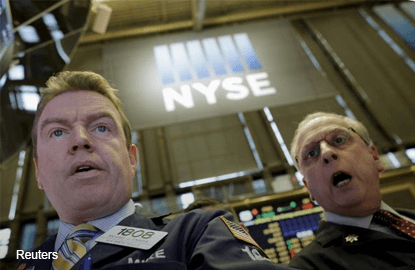 A lack of upbeat technical measures made some investors doubt that Thursday's gains would hold, and many remained cautious the market could fall further. "It's a different situation than in previous years when you could buy the dip and be very confident," said Bruce Bittles, chief investment strategist at Robert W. Baird & Co in Nashville. "Here you have a trend that has turned negative and a Fed that is far less friendly than in 2012, '13 or '14." Billionaire investor George Soros told Bloomberg TV he shorted the S&P 500. With fourth-quarter reporting season under way, S&P 500 companies on average are expected to post 4.5-percent lower earnings, according to Thomson Reuters data. But excluding the badly bruised energy sector, earnings are seen growing 1.6 percent. The Dow Jones industrial average ended 0.74 percent stronger at 15,882.68 points and the S&P 500 gained 0.52 percent to 1,868.99. Earlier in the day, the S&P 500 was up as much as 1.64 percent before losing most of that gain. The Nasdaq Composite edged up 0.01 percent to 4,472.06. After the bell, Starbucks Corp gave a current-quarter forecast that missed analysts' estimates and its stock fell 3 percent. The recent volatility has led to a spike in volume. About 9.9 billion shares changed hands on U.S. exchanges, compared to the 7.8 billion daily average for the past 20 trading days, according to Thomson Reuters data. Home Depot gave the biggest boost to the Dow, rising 3.23 percent after JP Morgan said warm weather could help the home improvement company. Kinder Morgan surged 15.6 percent as the pipeline company outlined plans to cut debt and spending, raising the chances of a higher dividend. Union Pacific fell 3.55 percent after the railroad operator said weak business conditions would persist in 2016, a warning that also weighed on its peers. The S&P 500 posted no new 52-week highs and 14 new lows; the Nasdaq recorded 4 new highs and 91 new lows. Advancing issues outnumbered declining ones on the NYSE by 2,003 to 1,075, for a 1.86-to-1 ratio on the upside; on the Nasdaq, 1,508 issues rose and 1,292 fell for a 1.17-to-1 ratio favoring advancers.